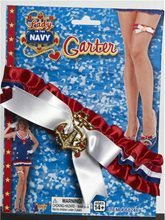 4" Sailor Peep Toe with Anchor Heels.Includes: One Pair of 4" Heels.Available Size: Womens - Size 7, Womens - Size 8, Womens - Size 9.Color: Blue Patent.Blue and White Patent Peep-Toe Sailor Girl High Heels with 4" Stiletto Heel on a 1" Platform. 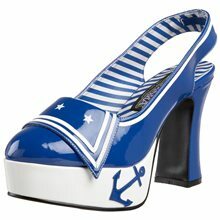 This cute new style by Leg Avenue Shoes by Ellie feature a red nautical anchor charm over the vamp. 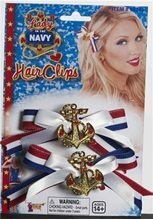 Sooooooo cute with a sailor girl costume or simply a nautical themed dress! Anchor Sailor Adult Shoes.Includes: One Pair of Anchor Sailor Adult Shoes. Available Size: Womens - Size 7, Womens - Size 8, Womens - Size 9. *Costume and Accessories Not Included. Sold Separately. Complete your sailor costume in these Anchor Sailor Adult Shoes. Available in women's sizes 7, 8 and 9. 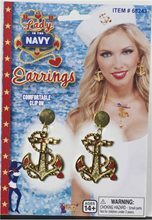 Lady In The Navy Gloves; She can pass with flying colors wearing the Lady In The Navy Patriotic Costume Gloves With Gold Anchor Charm.